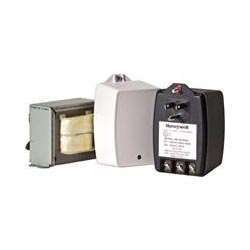 The HTP2450 plug-in AC transformer is the largest in Honeywell's HTP series, with a 24VAC/50VA output reading. The HTP2450 can be plugged directly into the wall and comes equipped with built-in thermal protection. The transformer is designed with a case mounting tab which allows it to fit securely to a wall outlet. Typically used in security systems that require low-voltage AC power or as part of a DC power system.